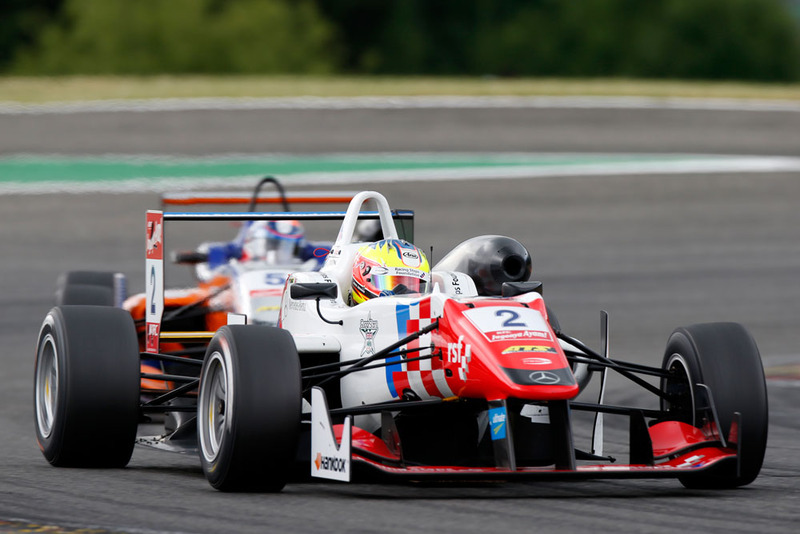 Jake Dennis finished fifth in the opening Formula 3 European Championship race at Spa this morning after an undiagnosed issue reduced him to a sitting duck along the circuit's long Kemmel Straight. The RSF-backed Prema driver lost a place at the start when Carlin's Antonio Giovinazzi cut across his bows to launch himself into the lead ahead of pole-sitter Felix Rosenqvist. The impeded start left Dennis circulating in third but that soon became fifth as first Van Amersfoort's Charles Leclerc swept by to join in the fight for the lead, followed half a dozen laps later by Signature's Alexander Albon. The hapless Prema driver then slipped to sixth after Mucke's Santino Ferrucci followed suit. But within two laps he was back up to fifth due to a collision between Giovinazzi and Rosenqvist, who had squabbled over and swapped the lead on three of four occasions. With the pair and Leclerc jockeying for position on the run into Les Combes, Giovinazzi veered left making contact with Rosenqvist in an incident that put the Italian out on the spot with a puncture - and subsequently earned him a three-place grid drop for race two. Rosenqvist took to the escape road and re-joined in second behind new leader Leclerc while Albon and Ferrucci closed in behind. Dennis, meanwhile, dropped further behind and into the clutches of Carlin's George Russell. But with only three laps left his pursuer was unable to get close enough to mount a move for the place. "I've no idea what the problem was," said Dennis. "All I do know is that although we [Prema] ran the lowest downforce out of everyone, we were horrifically slow down the straight. "We [the Prema drivers] all ran exactly the same downforce but even compared to Felix [Rosenqvist] I was slow. "So, whether it was something to do with the engine or not, I don't know. It's the same car, the same engine and it's not exactly hard to floor the throttle down the straight - so who knows. But there was no way I could defend out there." "Hopefully we can identify the problem before race two." Dennis, who qualified seventh for the follow-on encounter, will now start from fifth on the grid as a result of post-qualifying penalties handed down to Motopark's Sam MacLeod and Fortec's Pietro Fittipaldi. The pair's cars both failed scrutineering checks.